After releasing our amazing worldmap and client optimizations we kept working hard and are ready to announce improved dueling interface, along with new rules to duel. - Interface has been completely remade for new rules to fit in. - Equipment rules; you can now choose one by one which equipment is allowed in your duel. - In turn, we have deleted the "No weapons" rule. Equipment rules are now replacing this option. - Hitpoint Offset is now displayed on the bottom of your stake containers. You can read more about Hitpoint Offsets here. - 3 completely new rules! No RSCR items. This rule will forbid you from using any custom RSCR items in the duel. This covers all the items that has never existed outside RSCRevolution. We are happy to inform you that the login verification e-mail link is now fixed and works as it should. Our hard work won't stop here though. We are still continuing to work on upcoming updates, which will be PK/Wilderness/PVP related and a bunch of bug fixes. Speaking of bugs! 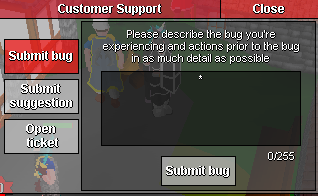 If you find any, report it in game via support interface which you can find from the options section. This will help us to improve the playing experience for everyone! That's all for today folks, stay tuned! Got problems with any of RSCR Staff members? Feedback of our modding in general? Private message me on forums or our discord and I'll look into it. ! Heard from a little birdie that there's some possible Deadman updates coming can you give us any info on that? I love this dev team, wish OSRS had one similar. This is very awesome! I'm especially excited about the no drinks and no rscr items options. "I see..." said the blind man as he pissed into the wind "It's all coming back to me now! ".